Come enjoy the fall foliage with Casey Trees on October 15. Jorge Bogantes Montero, from the Anacostia Watershed Society and Shawn Walker, Urban Forestry Instructor for Casey Trees will lead a tree walk at Fort Dupont from 10:30 a.m. until 12:30 p.m.
As part of Feet in the Street (FITS) Day, the roads of Fort Dupont will be closed to vehicles. Take advantage and stroll around the park. Participants in the tree walk will learn about notable specimen and their characteristics, as well as basic tree identification methods. There are only a few spots left in the October 15 Tree Walk at Fort Dupont, so register soon! For more information and to view all upcoming events, check out our calendar. 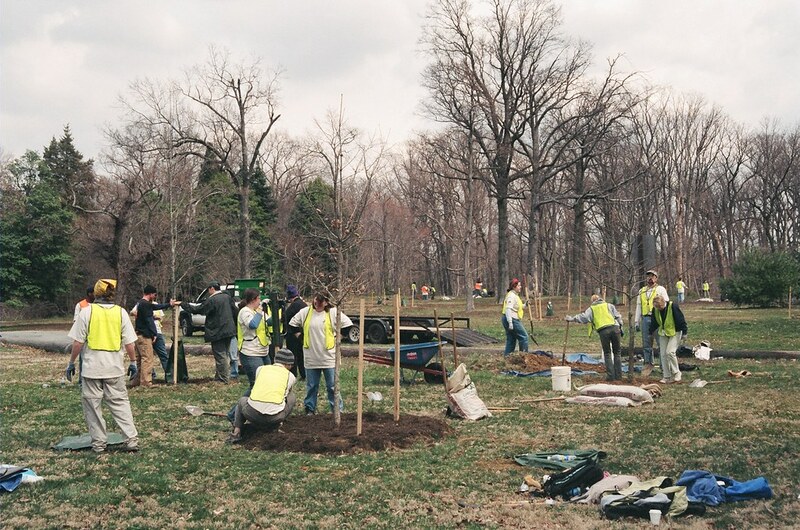 Casey Trees volunteers at a tree planting at Fort Dupont in 2006.